We have many visitors at Melliodora. Friends and neighbours drop in, or pick up veggie boxes and bulk food through Hepburn Relocalisation Network. We have people coming here to take part in our monthly garden and house tours. More than 100 people have come through the gate for both tours this season. They go home inspired and buzzing at the end of the tour (There are still three tours dates to visit Melliodora this season: March 1, April 5 and May 3 and still places available, but please make your bookings early here as last year, we saw a surge of interest towards the end of the season, and regrettably had to turn many people away). 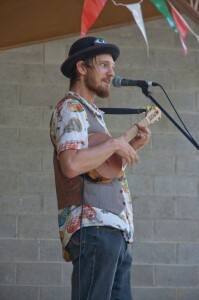 We also have visitors who stay here longer, eat, work, sleep, and experience a permaculture life. They are voluntary helpers, we call them interns. They come from all corners of the world with different skills and life experiences, but they have one thing in common; they are all keen learners. 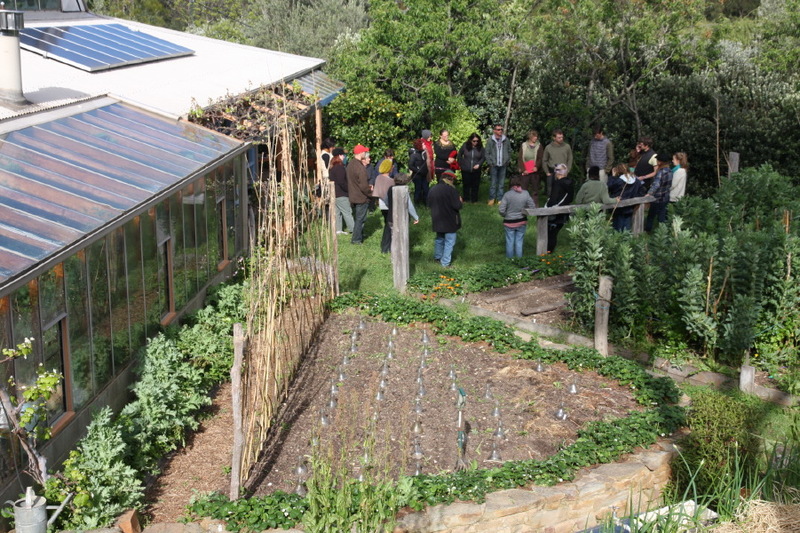 They come to experience what permaculture living is like at a well established mature permaculture site. Alister Tuffnell recently came and stayed with us for three weeks and has sent us this piece reflecting his time here. With Alister’s kind permission, here’s “Lessons from Melliodora”. For quite a while I have thought I would like to make a living from farming. After constantly hearing my dreams of farming, my wife Christine who has a real understanding of the hard realities of farming suggested I go to a farm to get real experience (reality) before I jump in to something I know very little about. 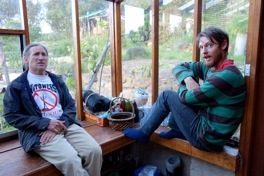 And she suggested I apply to do an internship with the co-founder of Permaculture, David Holmgren. So I applied at Melliodora, in Hepburn Springs. When I got accepted to do a three week internship I read a book called Fields of Farmers by Joel Salatin, which is about mentoring and interning. I attempted to heed his advice for the intern: from first accepting everything and forgetting judgment up front, to not being a prima donna about the jobs that need to be done. Salatin states that he has learned something from every farm he has visited. Sometimes it‘s simply a slick new gate latch. He goes on to explain that interns must not be casual observers; “When you’re out working with a mentor get up where you can see. What really is the technique? How does he hold the hoe? Foot placement? Body placement? Eyes in relation to hands? Every single thing, every single thing has a host of nuances”. I have just completed the internship. Melliodora is a 1 hectare garden farm and sustainable home which is a model of small scale intensive permaculture. David Holmgren and Su Dennett designed and built the sustainable home and farm (with many helping hands) and they maintain mixed food gardens, orchards, dams and livestock (chooks, geese and goats), as well as do ecosynthesis (use of introduced species to fill niches in a disrupted environment, with the aim of increasing the speed of ecological restoration) creek revegetation. David and Su openly shared their knowledge and experiences with me and the other interns. To be able to spend three weeks working at one of the best examples of permaculture, under the guidance of such experienced mentors, was a real privilege. I learned by observing David and Su and by doing the daily garden farm chores. Perhaps I learned most through osmosis, just being there. I had many stimulating chats with David and Su. There was much time for dialogue and explanations about why things are done in such ways at the garden farm. On one occasion in the garden I asked David about his method of gardening and he explained the importance of intuition and listening to his emotions. For example on this summer day it was cooler and it had been raining earlier which provided extra moisture in the soil. 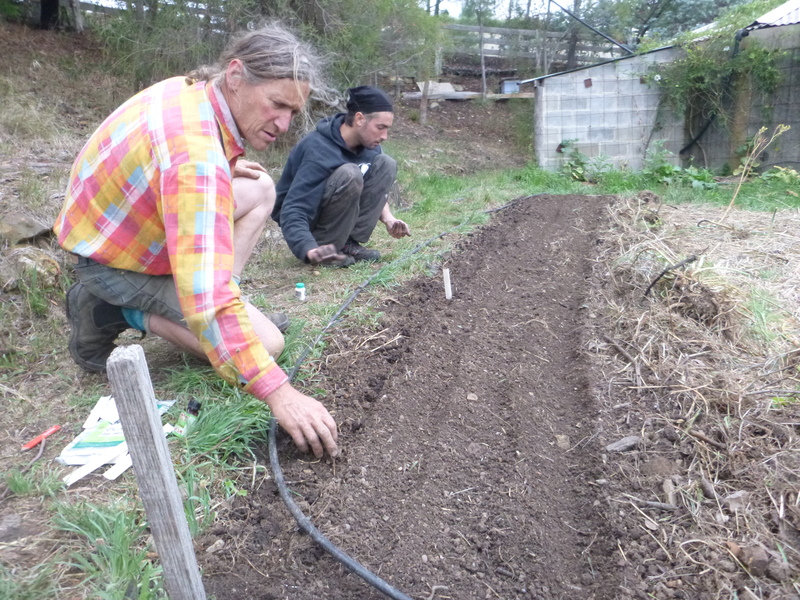 David described how this ‘autumn-like’ weather made him feel like planting, and so that is what he did today: sowed carrots, daikons and butter lettuce. Melliodora has been designed to mimic the patterns and relationships in nature. After 30 years it continues to work productively and sustainably due to its systems management. 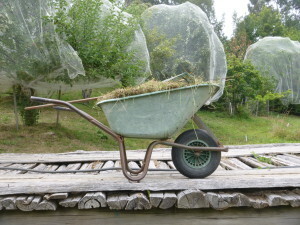 Many applications such as chooks and orchards have been adopted (rather than single use farming) which require interconnected knowledge. 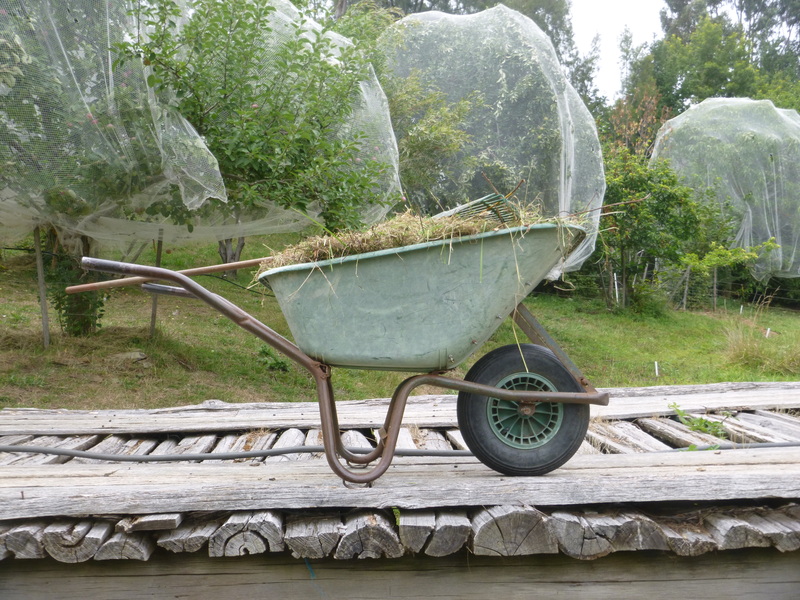 Human physical labour rather than complex machines are used to organise and maintain the permaculture garden farm. The amount of embedded knowledge that David and Su have can be overwhelming at times. To try to cram into three weeks a lifetime’s knowledge and experience couldn’t be done on my notepad which I kept with me at all times. However through the stories I was told and the context of doing , the internship became a means of developing habits –not just procedural how-to’s but the way I think and behave. The effectiveness of the internship was that it put me, the student, next to masters who have earned their status through time and trial. My confidence grew as David explained some of the mistakes and changes in thinking they had made in their thirty years at Melliodora. And what he has learned from his mistakes and observations. For example David described to me, while we were picking hazelnuts, how he had originally placed too much lime in the soil for hazelnut trees. Also he described how his original thinking at Melliodora had a large focus on fruit trees but now his focus has increased on nut producing trees. Some highlights of the three weeks included walking around the property in the rain with David observing and maintaining water flows. This was very exciting and educational for me as we walked around in our raincoats seeing water fall from the sky and flow along the contours of the land. David has designed the landscape of Melliodora to catch and store water from a large catchment of 40 hectares. On this day I observed the two dams (0.8 Megalitre and 0.3 Megalitre capacity) fill up with water to capacity – much needed to maintain a healthy intensive vegetable garden and orchard at this time of year. 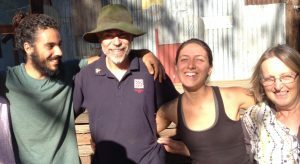 Another highlight was working in the garden with David and two other interns from France, Karl and Aline. Being in the garden for several hours each day allows one to observe and become attuned to changes and progressions in plants and animals. The meals together were great. The food was brilliant, healthy and delicious. There is something about eating, preparing and cooking your own food immediately from your garden and animals that cannot be matched. Working with David and Su, their immediate family and other interns, and interacting with the local community allowed me access to an intended vocation without the full responsibilities of running a business. 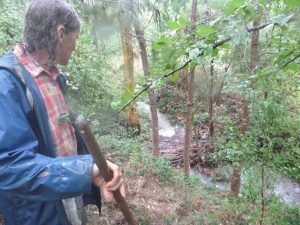 At Melliodora, I got to test the waters of permaculture garden farming and see if it is something I want to seriously pursue. It is a rare opportunity to be taught permaculture directly from a concept’s original developer. 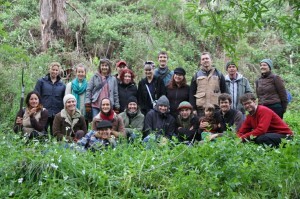 It is a unique opportunity to learn permaculture at Melliodora, one of the most mature permaculture systems around. When this unique opportunity materialises, people have a pretty special experience. No doubt the students of the V.E.G. (Very Edible Gardens) PDC taught David Holmgren over the weekend will forever remember the weekend. They had not just a team of awesome teachers, Dan and Adam, as well as David, but were also treated to food prepared by Su Dennett. Su gave the visitors a feast, making use of Melliodora’s abundance, fresh from the farm garden, with preserved food from past seasons, and supplemented by other locally and ethically obtained food items. What better way to learn permaculture! 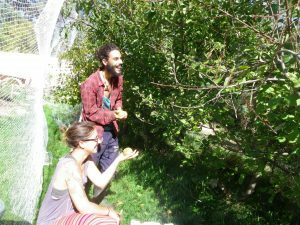 The dynamic permaculture duo will be back again (with other excellent teachers) to host a PDC at the Rocklyn Ashram in February 2014. Bookings have just opened but places are filling fast for this course, so if you have been thinking about it (but have not done anything yet), you still have time, but we recommend you to act pretty soon. VEG PDC (March to May 2014) near Melbourne. 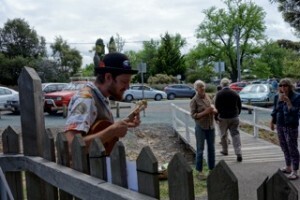 The Food Forest Permaculture Design Course in Gawler, South Australia. 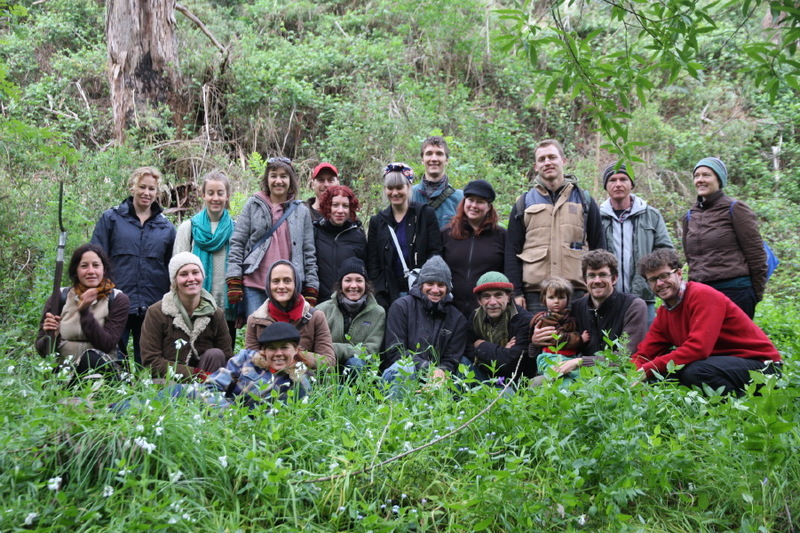 The Milkwood Winter Permaculture Design Course in Sydney. More photos from the weekend, VEG’s collection.